Our SANAS accredited test laboratory is capable of hydrostatically pressure testing welded and seamless steel as well as aluminium cylinders with a volume of between 0.5 and 1200 litres to pressures in excess of 450 bar. Further services that we offer in the workshop include filling of blended gas cylinders for life raft, helicopter and fixed wing aircraft flotation device inflation, eddy current testing of “old alloy” aluminium cylinder neck threads, chemical free internal cleaning of corroded cylinders up to 80 litre capacity using our custom made tumbler, oxygen cleaning and valve servicing and refurbishment. 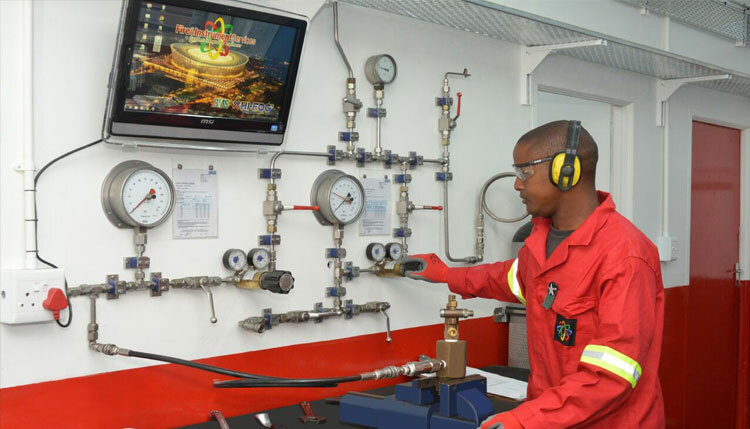 Our workshop includes South Africa’s only facility for quick acting valve testing and calibration, which is required by the standards for fixed fire extinguishing systems. Our custom engineered tooling ensures that we can remove most valves without damage and we are constantly upgrading our tooling to cater for new valves entering our workshop. We thrive on new challenges and are always willing to take on the unusual work that others shy away from. Fire and Instrument Services’ CAD office is one of the most versatile in the industry today. We are able to do any detailed designs, including 3D, in the electrical (instrumentation) and mechanical piping, including hi-pressure SS316 tubing. The CAD office is also in charge of the design calculations and isometric drawings for the hydraulic calculations and flow calculations for a number of systems used in the fire and automation industry. The CAD office also prepares all the datasheets required for our onsite installation teams as well as any assembly datasheets required from our workshops. We currently have hundreds of these datasheets available to our staff that have been built up over the past years.